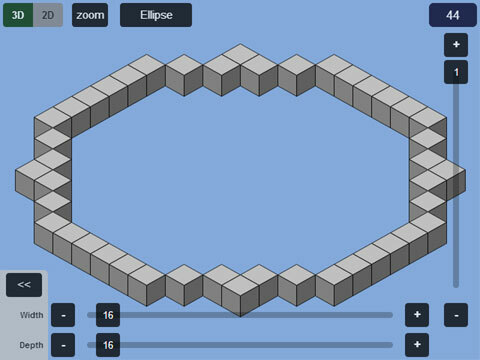 Model ellipses and curves using Plotz, the HTML5 modeller for Minecraft. Great for curved walls and enclosures or the curved span across as suspension bridge. Ellipses can be modelled up to 256 width and depth. This page will guide you on how to use Plotz Ellipse generator which can be launched from the link below. Start Plotz Ellipse Generator by selecting the ellipse model from the Plotz model menu or launching from the link above. A default ellipse will be shown and you can resize your browser or enter full screen mode if required to get more on display. Ellipses differ from other Plotz models as they are just one block (layer) tall. In this respect you can ignore the layer slider on the right. The sliders at the bottom control the width and depth of the ellipse to a maximum of 256 blocks. The number of blocks required to build the ellipse in Minecraft is displayed in the top right. You can zoom the display as required. Hide the dimension sliders by selecting the << button. Select either of the dimension values to get the sliders back. Get back to the model menu using back in your browser or by selecting the model name button at the top. 2D is probably the best mode for building ellipses. Switch to 2D mode using the 2D button in the top left of the display. 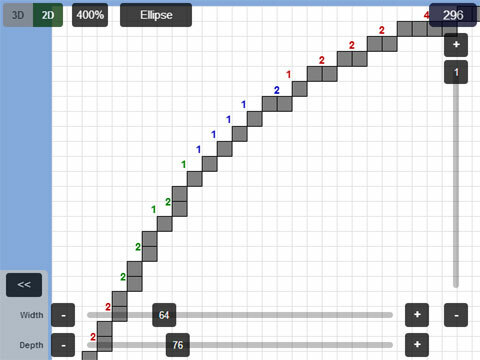 In 2D mode bock counts are display in colored groups of 5 to help you build curves. As ellipses have symmetry you only need to build the top / left quadrant, orientate yourself by 90° in Minecraft and build a further 3 times (if required).